Of the several recently produced and released documentaries covering the vitally important issue of colony collapse disorder, More Than Honey is the most comprehensive and compelling in conveying the story of the domesticated honeybees that are mysteriously disappearing — or dying — by the hundreds of thousands each year. Filmmaker Markus Imhoof has done a brilliant job of showing and telling all sides of the story — including what would be the honeybees version of it, if honeybees could speak. MORE THAN HONEY, a new documentary by the Swiss filmmaker Marcus Imhoof, is looking into the fascinating world of bees, showing small family beekeepers and industrialized honey farms. 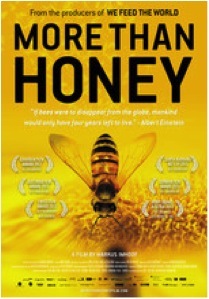 MORE THAN HONEY is a film on the relationship between mankind and honeybees, about nature and about our future.